Happy weekend friends! I’m very tired out from the school week—I had two tests and a quiz yesterday—and I am SO glad that it’s Saturday. I recently had the honor of being nominated for the Mystery Blogger Award by the wonderful Dezzy @ The Thoughtful Voice (Thank you so much Dezzy! Highly recommend checking out her blog because it’s amazing.) and I am so excited to be sharing my post for the award! Ask your nominees any 5 questions of your choice; with one weird or funny question. I have a huge extended family—around 30 first cousins, mostly on my mom’s side. I’ve been blogging for over a year and a half! My blog has changed a lot since I first started and I’m so proud of how far my little brainchild has come. Sour cream & onion chips are unquestionably the best kind of chips in my opinion. 1. What is your favorite thing about being a blogger? I’d say that my favorite thing about being a blogger is having a creative outlet where I can gush about the things I’m passionate about. It’s so nice to be able to talk about the things that I love in a supportive community filled with other people who are passionate about the same things as me. 2. Are you the type of reader to DNF (Did Not Finish) a book you dislike, or do you finish a book no matter what? Why? 3. What are your hobbies or talents besides reading? 4. Spell out each letter of your name with a book or song! This is such a great question! For an extra challenge, let’s see if I can name books without looking at my bookshelf or Goodreads. I I Was Born for This by Alice Oseman // A book on my tbr that I’m super excited to read! 5. Share a Bookish Confession! I haven’t read A Court of Thorns and Roses! I know that the series is so popular and so many people love it, but it just doesn’t sound that great to me, for a variety of reasons. The rules for the tag say to share your best posts—I’m not exactly sure how to interpret that, but I guess I’ll share two: one that has gotten the most views, and one that I especially enjoyed writing, respectively. I still honestly have no idea why, but the post on the left has had a ridiculous amount of views since I posted it in July 2017. It has five times more than my second most viewed post, and it still frequents my list of top posts of the day now, over a year later. I mean, it was a pretty good post, but I don’t really understand what happened?? 🤔 I’ll take it though. The post on the right, a recap of what I read in 2017, was one of my favorite posts to write. It involved MANY pie charts which I had a blast making because I’m a nerd. It ended up being so long though that I think I’m going to split my 2018 recap into multiple different posts. If you want to do this award, consider yourself tagged! And let me know in the comments—do you DNF books? What are some of your hobbies? 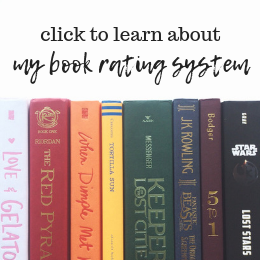 Are there any super popular books that you’re not interested in reading? Mimi and I just found this one. Congratulations on your nomination. It is well deserved. I’m totally with you about A Court of Thorn and Roses. The premise sounds so good to me, but I’ve heard things about the series that has steered me away from it. Anyways, thanks for a wonderful post! I loved getting to know more about you 🙂 Thanks for always being awesome! Great post, Annie! Aww you’re so welcome; I honestly love your blog and every single one of your posts! 💖 Really enjoyed reading your responses to my questions. I completely agree with your answer to #1; I love being in the book blogging community full of supportive people like you! 😊 And I haven’t read A Court of Thorn and Roses either (or Throne of Glass, for that matter, lol).